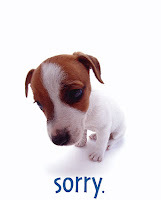 I just wanted to apologize if I have seemed cranky lately. Some of it stems from watching some of you not live up to your academic potential. You all have no idea the immense ability you have, and when you squander your ability, I get a little nuts. Not to mention, all the boo-hooing about the research paper. Listen, you CAN do it! I know it seems a little foreign right now, but YOU WILL GET IT! All I am asking is that you look at this challenge as an opportunity for growth. If you can look at life's obstacles this way, you will be just fine. The course selection situation got to me, too. For this, I am most apologetic. Much of my frustration came from that, which you had no control over. I also apologize for the missed class time. You deserved my FULL attention, and I could not deliver it. Basically, I could have handled all of these situations better. You deserve the best of me, and I could not give it to you this week. I promise, promise, promise to be better next time . . . all because you mean so much to me! SMILE, REST THIS WEEKEND, SPEND TIME DOING SOMETHING FUN, AND KNOW THAT I BELIEVE IN YOU! YOU WILL DO GREAT THIS TUESDAY! It's ok C-Rod. I understand(: I know how much pressure is being put on you because of the FCAT. But don't worry, we will ALL pass. You have prepared us enough and we'll make it. Thanks for being such a great teacher(: I'm thankful to have you. do not worry you are amazing and we love every second we spend in your class room. Volcano hot sauce is the best ! so we forgive you even though we have no idea why the heck you feel guilty trying to make us better when you already have!!!! We love you and we will try our best this tuesday because we have all worked hard. WE WILL PASS NO DOUBT ABOUT IT!!!!!!!!!!!! C-Rod you are way too hard on yourself, you are amazing and i am sure all of your students appreciate it as much as i do. there is no need to apologize, you push us because you care, and i understand it. as esther said, you are a great teacher. you have been an inspiration for me and i thank you so much for that. It's Ok. We all know how stressing this all can be. Trust me, I need time in a bottle or something. I'm never home anymore. But we'll all do our best and I'm sure we'll do good. Hang in there. Things will get better! Hey miss it's cool we all understand that the FCAT puts alot of pressure on you. But remeber that because of you pushing so hard we are all going to do marvolous on the FCAT. P.S. Don't worry I am going to answer every question on the fcat, because I was one of the people who left some blank in the packet. Thanks, John. I know you will do well! itz all good Mrs. sometimes we do push your buttons. I think everyone has been off those past weeks pressure and stress has made everyone cranky and emotions are flying but I am sure all your students understand you, including me. I know its really hard to apply time to everything and I'm trying my hardest to make you proud of me.....I'm ready!!! And each day do the things he should"
And get the best he can from school"
Ours this blessed task forever." You all, I'm sure, are doing GREAT! Elizabeth - I LOVED THAT POEM! Thanks for that! Oh miss your so adorable. You are utterly incredible and for that the crankeness is absolutely understanable. You go above and beyond for all of your students and i cant say I've ever felt so much love from a teacher as i do from you. You have made me believe that i can do better,i write and write and i find myself always trying to write just a little more or add and change words.I am in love with writing,I would be nothing without it and you have made it more a part of my life.Thank you! I read this a little late, but it's ok and I forgive you,you stress out a lot and there are always going to be times that you get a little upset. I've barely seen you this week and I MISS YOU! You are a fantastic department chair!!!! Keep up the great work. Love you lots!!! Kristy! I am so blessed to have you in class. You are an amazing writer and you get better with each and every assignment! Keep up the good work! Love you!